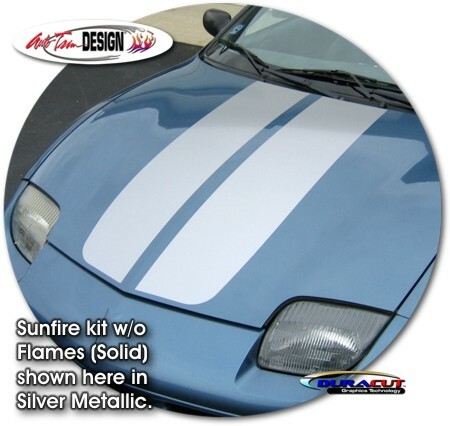 Make your ‘95-'05 Pontiac Sunfire Coupe "Hot-Looking" with this awesome Rally Stripe graphics kit. 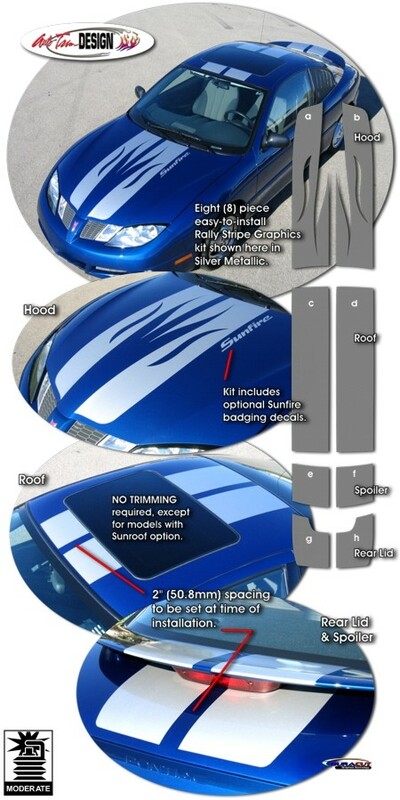 Easy-to-install kit is packaged as a set of eight (8) pieces with a unique flame design cut into the hood pieces that cooperate with the Sunfire's distinctive hood lines as shown. They're PRECUT and ready to install in a wide variety of colors - NO TRIMMING required (except for Sunfire models with Sunroof option)! Stripe package is not just a set of 9.5" (24.13cm) strips in a box. Graphic kit consists of prefitted, tapered and contoured pieces as shown in the illustration. This kit is specifically made for the '95-'05 Pontiac Sunfire Coupe factory hood, roof, spoiler and rear lid areas and will not fit any other vehicle. Note: While a kit is available for the '95-'02 Pontiac Sunfire w/o Flames (Solid), due to the unique indentations found on the Hood of '03-'05 Pontiac Sunfire models, a kit w/o flames (Solid) is not available.